RHYNCHOPHORA Arènes, Notul. Syst. (Paris) 12: 127. 1946.—Type: R. humbertii Arènes. Calyptostylis Arènes, Notul. Syst. (Paris) 12: 131. 1946.—Type: C. humbertii Arènes [R. phillipsonii W. R. Anderson]. Slender woody vines; stipules interpetiolar (borne on stem adjacent to leaf bases), distinct, triangular or subulate; leaves decussate; petiole mostly eglandular but rarely with 1–2 small glands near apex; lamina eglandular or bearing 1 small gland abaxially on margin near base on one or both sides or on surface above base. Inflorescence paniculate with the flowers borne ultimately in short-stalked umbels or condensed corymbs of 4–13 or more; bracts and bracteoles present but very small, subulate or very narrowly triangular, eglandular, ± persistent; pedicels sessile or short-pedunculate. Flowers radially symmetrical, staminate or morphologically bisexual (the latter probably functionally pistillate) with the two types borne on different plants, i.e., species functionally dioecious. Sepals eglandular, leaving petals exposed in enlarging bud; petals white, glabrous or with a few straight appressed hairs abaxially in center, spreading in anthesis, with a short claw, the limb flat or concave, ovate or broadly elliptical, entire or somewhat erose or denticulate; stamens 10–12 in staminate flowers, 10 in “bisexual” flowers, glabrous, ± alike, the filaments longer in staminate flowers than in "bisexual" flowers, short-connate only at very base; anthers basifixed, the locules separated on a wide flat connective; pollen from staminate flowers lacking ectoapertures but possessing 5–7 non-equatorial pores; staminate flowers without any rudiment of a gynoecium; gynoecium of “bisexual” flowers 3- or 4-carpellate, the carpels connate their whole length in ovary; ovary with as many locules as carpels, each locule containing 1 ovule; styles as many as carpels, distinct, slender but of uniform thickness their whole length, the stigma terminal, large, reniform, revolute at margin, stigmatic over the whole upper surface. Fruit dry, indehiscent, samaroid, consisting of a turbinate or cylindrical nut bearing narrowly elliptical wings, 1 wing per carpel, each wing departing from middle or apex of carpel and spreading to horizontal to slightly reflexed, the plane of the wing perpendicular to the dorsiventral plane of the carpel, each style persistent at base of corresponding wing; seeds as many as carpels or fewer by abortion; fruit not subtended by a fleshy disc. Chromosome number unknown. Two species endemic to Madagascar, in deciduous, seasonally dry forests and thickets on sand, basalt, or calcareous soils, at 150–1500 m. [map] — Regional key to genera: Madagascar. Rhynchophora is unique in the family Malpighiaceae in its indehiscent fruit resembling a helicopter, with each carpel bearing a more or less horizontal elliptical wing. That fruit is so peculiar that it is difficult to see the homology of its wings to the lateral wings found in the dehiscent fruits of the sister genera Madagasikaria and Microsteira. In other characters Rhynchophora and Microsteira are so similar that it is difficult or impossible to determine flowering specimens to genus, but the dramatic differences in its fruits justify generic status for Rhynchophora. See the discussion in W. Anderson (2001b [pdf]). In Rhynchophora, as in Microsteira, the breeding system would appear to be androdioecious, i.e., some plants with staminate flowers (no gynoecium present) and others with bisexual flowers (both stamens and a gynoecium present). However, the pollen produced by the stamens in the "bisexual" flowers is inaperturate and presumably incapable of germination, in which case those flowers are functionally pistillate and the breeding system is actually dioecious (W. Anderson, 2001b [pdf]). Microsteira paniculata Arènes is a species of southern Madagascar, its range to the east of that of Rhynchophra humbertii and R. phillipsonii. It bears a strong resemblance to those two species, especially R. humbertii; its leaf hairs are straight like those of R. humbertii, but much denser and more persistent. It is known only from staminate specimens. 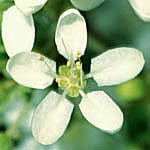 Until M. paniculata is found with pistillate flowers and, especially, fruits, it seems best to defer a decision on its generic disposition; it can be transferred to Rhynchophora if its fruit justifies that change. The stipules in M. paniculata are especially interesting, because they are sometimes enlarged to resemble miniature leaves, a character that is otherwise known in Madagascar only in Madagasikaria andersonii. 1. Lamina abaxially thinly sericeous to soon glabrate with the hairs straight, sessile, strongly appressed; wings of fruit radiating from at or below the middle of the fruit body, with a long tapered snout above the wings. 1. Lamina abaxially densely and persistently tomentose or loosely sericeous with the hairs raised and more or less sinuous or twisted; wings of fruit radiating from the apex of the fruit body, without a snout projecting above the wings. Etymology: The name Rhynchophora comes from the Greek words for snout or beak (rhynchos) and bearing (phoros). It refers to the conical projection borne at the apex of the fruit of the type species, R. humbertii.